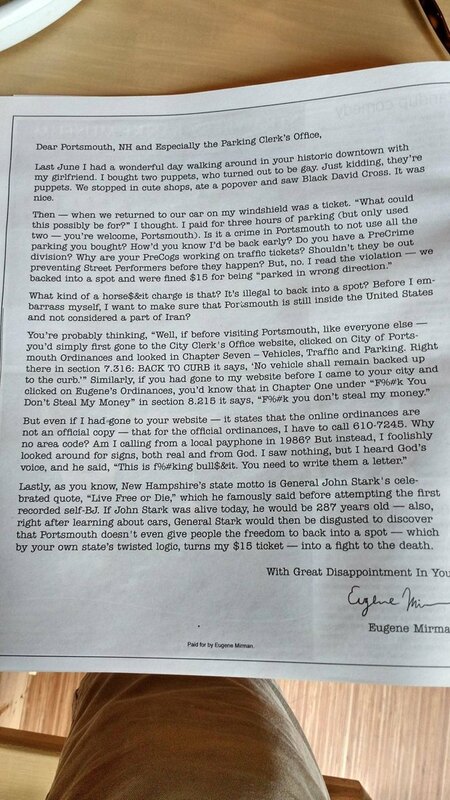 Standup comedian Eugene Mirman - the voice of Gene on the animated comedy series Bob's Burgers, bought a full-page ad in a New Hampshire newspaper to contest a parking ticket he got in the city of Portsmouth. Mirman had gotten a $15 ticket because he was "parked in the wrong direction" while he walked around town with his girlfriend. Lastly, as you know, New Hampshire‘s state motto is General John Stark’s celebrated quote, “Live Free or Die,” which he famously said before attempting the first recorded self-BJ. If John Stark was alive today, he would be 287 years old — also, right after learning about cars, General Stark would then be disgusted to discover that Portsmouth doesn’t even give people the freedom to back into a spot — which by your own state’s twisted logic, turns my $15 ticket — into a fight to the death. Mirman has a history of ranting in local newspapers. In 2011, he bought a full-page ad for $1,100 to call Time Warner Cable "an ill-run Soviet factory."